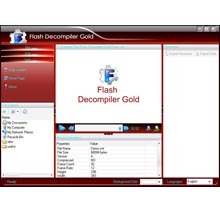 Free Flash Decompiler Gold is a powerful and reliable flash extractor. Flash Decompiler Gold allows exporting all resources such as images, shapes, sounds, fonts, texts, buttons, sprites, scripts, and frames from any SWF file. Moreover, those resources can be exported as FLA format. With one click, you can effortlessly convert files to (*.swf) or (*.exe) format. Vivid preview window makes Flash Decompiler Gold Free Version easy to use. ...... Flash Decompiler Gold allows exporting all resources such as images, shapes, sounds, fonts, texts, buttons, sprites, scripts, and frames from any SWF file. Moreover, those resources can be exported as FLA format. With one click, you can effortlessly convert files to (*.swf) or (*.exe) format. Intuitive preview window makes Flash Decompiler Gold easy to use. In our test, it works without a hitch and shows good speed. Free Flash Decompiler Gold is offered for evaluation only and can be downloaded from our website. Flash Decompiler Gold allows all users to experience Flash Decompiler Gold's innovative and integrated features for free. Certain features have been limited during evaluation period. Just try it and let it do more with your flash decompiling. To get a lifetime license for full features of Flash Decompiler Gold, you only need to pay a small registration fee. Upgrade it to entitle yourself to enjoy unlimited flash decompiling smoothly. Qweas is providing links to Flash Decompiler Gold 2.3.1.1377 as a courtesy, and makes no representations regarding Flash Decompiler Gold or any other applications or any information related thereto. Any questions, complaints or claims regarding this application Flash Decompiler Gold 2.3.1.1377 must be directed to the appropriate software vendor. You may click the publisher link of Flash Decompiler Gold on the top of this page to get more details about the vendor.